RBTH presents a selection of views from leading Russian media on the inauguration of new Ukrainian President Petro Poroshenko, including analysis of the new head of state’s first speech and news of a terrorist attack outside the Central Electoral Commission building during the ceremony. The Kommersant daily reports from the inauguration ceremony in which Petro Poroshenko was sworn in as the new president of Ukraine. In his inauguration speech, Poroshenko set out his priority tasks and proposed a peace plan for resolving the ongoing confrontation in the country's southeast. He promised to start a dialogue with the Donbass, at the same time ruling out the possibility of federalization, Kommersant points out. 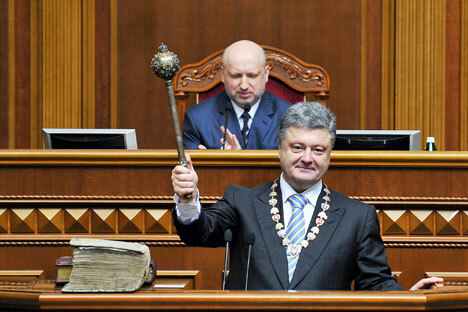 In addition, Poroshenko blamed the region's economic hardships on the previous president, Viktor Yanukovych, it adds. The newly elected president promised amnesty to all those "who do not have the blood of Ukrainian soldiers and civilians on their hands, those who were not involved in financing terrorism.” He also spoke in favor of conducting an early parliamentary election, which would also be held in the Donbass. Poroshenko promised to visit the region in the near future and hold talks with the peaceful supporters of the secessionist movement in the Luhansk and Donetsk regions. The new Ukrainian president also announced that "in the near future he would sign an association and a free-trade zone agreement with the EU and hopes to achieve a liberalization of the visa regime with the EU by the end of the year,” Kommersant concludes. "Local residents are pinning a lot of hope on the new head of state, who has promised Ukraine peace in the Donbass, European prospects and a fight against corruption," the paper observes. However, just as the inauguration ceremony was under way, a car with a Luhansk license plate was blown up outside the Central Electoral Commission building. The police are investigating the incident as a terrorist attack. According to an expert quoted by Gazeta.ru, the highlight of the inauguration was the absence of either the Russian president or prime minister, which "clearly indicates the diplomatic level at which the Kremlin intends to maintain dialogue with Poroshenko,” says the publication. "Unless Kiev stops entertaining the public with ridiculous statements that it intends to return Crimea or get billions in compensation from Russia, meetings between the Ukrainian and the Russian president will continue to take place in between diplomatic breakfasts somewhere in Normandy," Gazeta.ru concludes. The Vzglyad newspaper stresses that "Russia was represented by the ambassador at the ceremony [of Petro Poroshenko's inauguration]," while the overall foreign representation was quite impressive: Some two dozen presidents and prime ministers were present. These senior officials, Vzglyad suggests, were there to demonstrate the recognition of the new president's legitimacy. In his inauguration speech, the new head of state set out the course of his future policy: no federalization, and no official status for the Russian language. Poroshenko also promised an amnesty for those participants in protests in the southeast "who had not been involved in grave crimes." It was also obvious, Vzglyad says, that the so-called special operation against Donbass militiamen, whom the Kiev authorities describe as "bandits" and "terrorists", will continue. The paper points out that after Poroshenko was elected president, the antiterrorist operation continued on an ever-growing scale: Now the military are using heavy artillery and combat aviation.